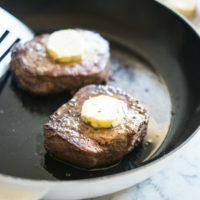 This pan-seared filet mignon with herb butter is the perfect meal for a date night in and is ready in under 30 minutes! 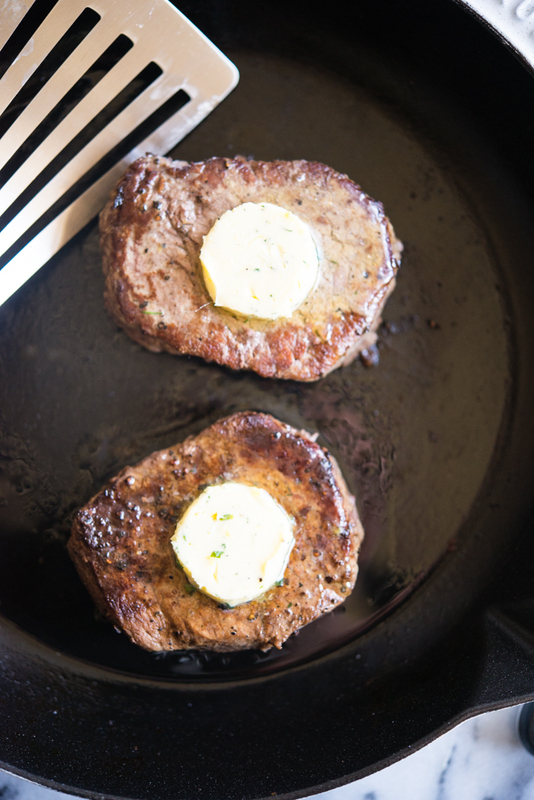 This filet mignon with herb butter is SO good! For some reason, making a steak always seems intimidating, but it really is easier than you think. Filet mignon is a special cut of beef because it is so tender, but it is also lower in flavor because of its low fat content. To counteract that and give you a flavorful AND tender steak, we made a delicious compound herb butter to put on top of the steak. Let's talk about this herb butter. 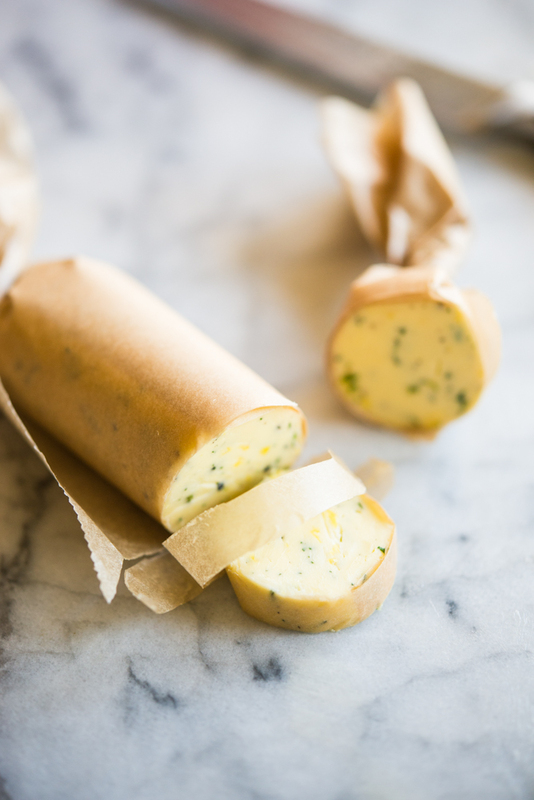 Compound herb butter sounds fancy but is really just softened butter mixed with fresh herbs. For this version, we combined grass-fed butter with fresh chives, dill, lemon zest, and a little bit of garlic. Once it is mixed together, you can place it on parchment paper and roll it into a log. Whatever you don't use on your steak, you can use later on other cuts of meat, in pasta, or for vegetables! After you make the butter, it is time to sear the filets! 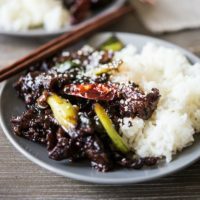 You'll simply season the filet mignon with salt and pepper, and then add them to a hot cast iron skillet and sear for 3-4 minutes per side. After that, you'll place the steaks in the oven for about 10 minutes, and you're good to go! For a full meal, you could add a baked potato and veggie to the side, or you could take it over the top with this roasted asparagus, this no-stir mushroom risotto, or these loaded twice-baked potatoes. Whatever you choose, you can't go wrong with this filet mignon with herb butter. About our Filet Mignon: Filet Mignons are one of the most tender, well-known, and expensive steaks. 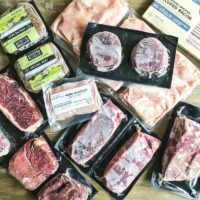 ButcherBox Filet Mignons are 100% grass-fed and grass-finished and raised free from antibiotics and hormones. You can head here to get your FREE filets + $10 off when you order before February 28th, then you can get straight to making your filet mignon with herb butter! 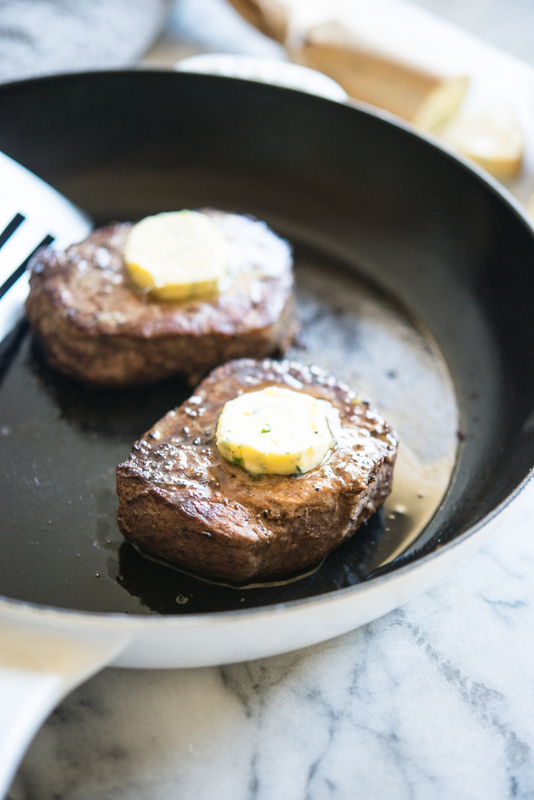 Perfectly-cooked filet mignon is topped with a flavorful herb butter for a main dish that's ideal for a date night-in! Mix together all of the ingredients, then place on a sheet of parchment paper and roll the butter into a log. Twist the ends of the parchment paper to seal, then refrigerate. Add the ghee to a large cast iron skillet, or other heavy-bottomed, oven-safe pan, over medium-high heat. Season the steaks with salt and pepper, then when the skillet is hot, add the steaks and sear for 3-4 minutes, until browned, then flip and cook an additional 3-4 minutes, until browned. Transfer the steaks to the oven and cook for 8-10 minutes for medium-rare (135 F) to medium (140 F) steak. Once the steak has reached your desired temperature, remove the steaks from the pan and let rest for 5-10 minutes. Top with herb butter and serve! 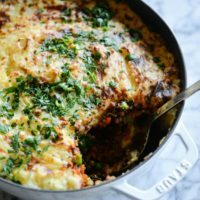 Can you use ghee to make the herb butter? 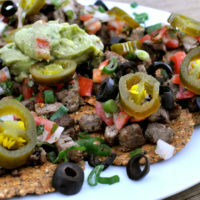 I’m dairy free but this looks so yummy!! SO EASY, and not exaggerating, best filet mignon of my life. Paired it with the suggested asparagus and twice baked potatoes, followed by the flourless brownies. A Valentine’s Day dinner we will never forget. Thanks for making good, healthy food so attainable! That sounds like the best meal ever, so glad y’all enjoyed it Miranda!